Four St. Mary’s University students each earned $10,000 scholarships, funded by the USAA Foundation, Inc. for future work with local nonprofits. Tawny Davis (from left), Samantha Salazar, Jocelyn Alvarez Bibian and Daria Flowers collaborating at the Najim Center. With industry demand growing for employees with visual communication skills, the newly created Business Innovation Scholarships — part of a two-year grant St. Mary’s received from The USAA Foundation — were awarded to St. Mary’s students minoring in Visual Communication Design. 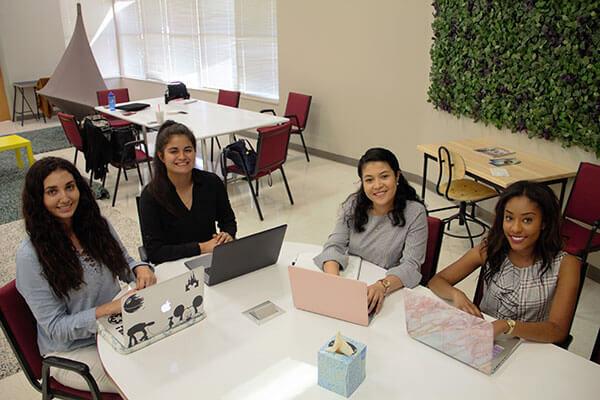 The recipients — senior Marketing major Daria Flowers, junior Communication Studies major Tawny Davis, junior Marketing major Jocelyn Alvarez Bibian and junior Communication Studies major Samantha Salazar — will work with the Maestro Entrepreneur Center and the Family Justice Center of Bexar County. Davis and Salazar will be assigned to the Family Justice Center to reach out to at-risk children and families through surveys, advertising and the creation of an app for children that teaches them about healthy relationships. Flowers and Bibian will work to rebrand the Maestro Entrepreneur Center and assist in promoting the growth of small businesses in Bexar County. Much of the students’ work will be developed in the Harvey Najim Center for Business Innovation and Social Responsibility, a newly renovated space on the St. Mary’s campus that encourages students of all disciplines to collaborate on real-world projects. “We take in projects offered to us by organizations of all kinds for students to produce solutions,” said Hugh Stevens, Director of the Najim Center. Stevens participated in the interview process of selecting the scholarship recipients, ensuring the winners were dedicated to community work. This year’s scholarship recipients expressed that they are both excited and nervous to begin their assignments. The students will work with their respective organizations until the end of Spring 2019, at which point, four new scholarships will be awarded for the following academic year.